Tubular steel arch supporting textile membrane roofing is investigated experimentally and numerically. The stabilization effects of the textile membrane on in-plane and out-of-plane behavior of the arch is of primary interest. First a model of a large membrane structure tested in laboratory is described. Prestressed membranes of PVC coated polyester fabric Ferrari® Précontraint 702S were used as a currently standard and excellent material. The test arrangement, loading and resulting load/deflection values are presented. 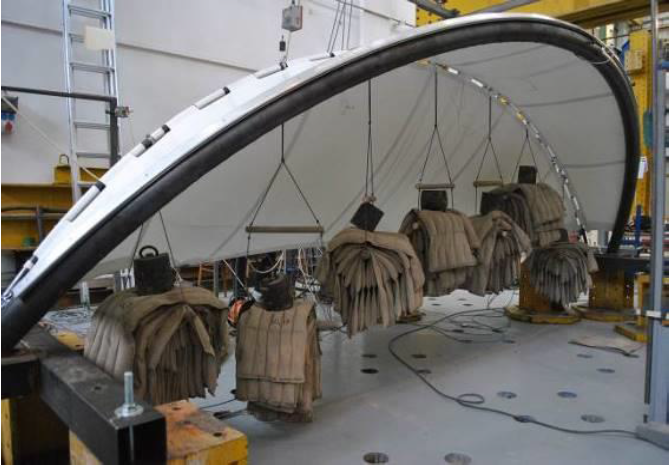 The supporting structure consisted of two steel arch tubes, outer at edge of the membrane and inner supporting interior of the membrane roofing. The stability and strength behavior of the inner tube under both symmetrical and asymmetrical loading was monitored and is shown in some details. Second the SOFiSTiK software was employed to analyze the structural behavior in 3D, using geometrically nonlinear analysis with imperfections (GNIA). The numerical analysis, FE mesh sensitivity, the membrane prestressing and common boundary conditions are validated by test results. Finally a parametrical study concerning stability of mid arch with various geometries in a membrane structure with several supporting arches is presented, with recommendations for a practical design. S. Kato, T. Yoshino, and H. Minami, “Formulation of constitutive equations for fabric membranes based on concept of fabric lattice model,” Engineering Structures, vol. 21, pp. 691-708, 1999. P. Gosling, “Basic philosophy and calling notice,” Tensinet analysis & Material working group, Tensinews, vol. 13, pp. 12-15, 2007. C. Galliot and R. H. Luchsinger, “A simple model describing the non-linear biaxial tensile behaviour of PVC/coated polyester fabrics for use in finite element analysis,” Comp. Structures, vol. 90, pp. 438-447, 2009. J. B. Pargana and W. M. A. Leitao, “A simplified stress-strain model for coated plain-weave fabrics used in tensioned fabric structures,” Engineering Structures, vol. 84, pp. 439-450, 2015. “Technet gmbh Berlin-Stuttgart,” http://www.technet-gmbh.com, 2016. D. Jermoljev and J. Macháček, “Implement- ation of non-metallic membranes into steel supporting structures,” Proc. Recent Advances in Mechanics and Materials in Design, Ponta Delgada, pp. 907-908, July 2015. “Formfinder software GmbH, wien,” http://www.formfinder.at/main/software/, 2015. O. Svoboda and J. Machacek, “Tubular Steel Arch Stabilized by Textile Membranes”, AITI, vol. 1, no. 2, pp. 50-52, Oct. 2016.